Click on the slides to zoom in as you read through the presentation. The Bay holds many secrets. And much of what makes it remarkable is invisible - hidden to the eyes of the hundreds of thousands who enjoy it daily. The Bay is an anomaly in many ways. It looks deep, but it's not. It looks permanent, but it isn't. If you had brought your time machine here 20,000 yrs ago, you could have landed it almost anywhere in this picture without getting wet. At that time, what is Bay today was a dry valley with a vigorous river flowing through it. Go back further in time - to 120 thousand years ago, and you would again see water - a very large Bay, bigger than this one. During the last Ice Age, there was a dry valley with the Sacramento-San Joaquin rivers flowing through it, out the Golden Gate to the ocean. 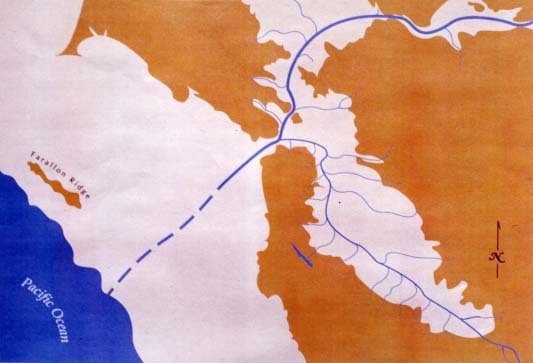 Note the course of these rivers - between Angel Island and Tiburon. They cut through what we now call Raccoon Strait. 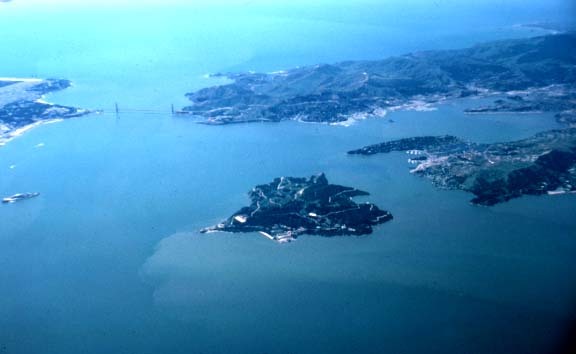 There must have been wonderful cascades and waterfalls between Carquinez Strait and the ocean. Imagine this scene without water in it, when the water drained out during the ice age that peaked 20,000 years ago. Then about 18,000 yrs ago, the climate changed and glaciers began to melt. Sea level rose, filling the valley up again. 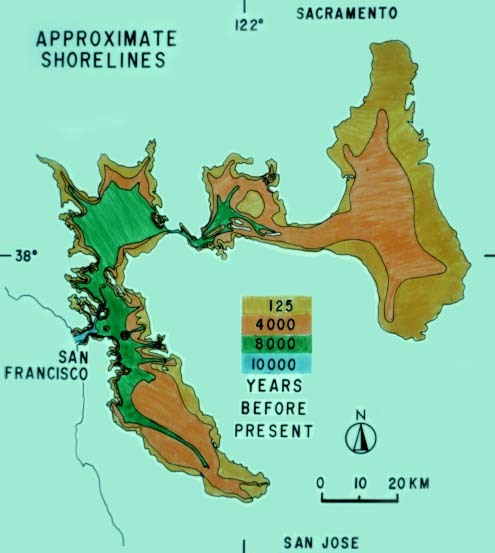 This slide by Brian Atwater of the US Geological Survey, shows the changing shorelines as sea level gradually rose and the waters returned to the Bay. 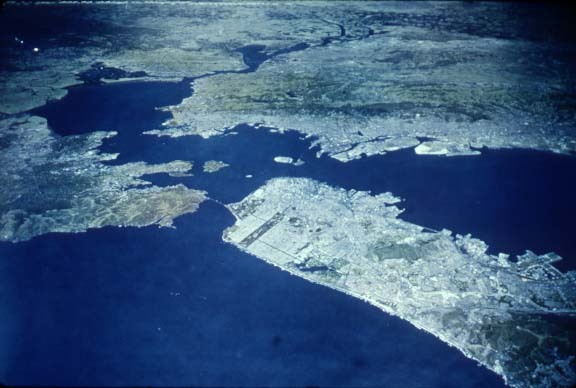 How do we know about the past history of the Bay? 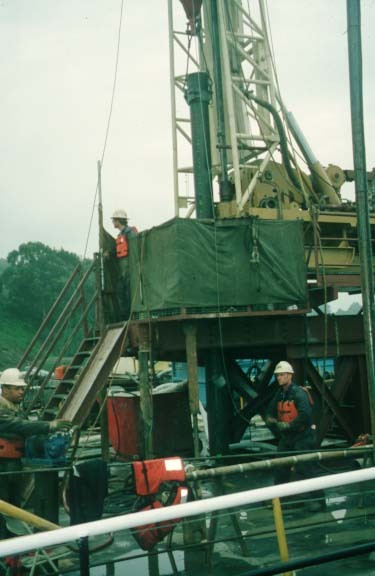 The information comes from cores drilled into the Bay muds, mostly by Cal Trans for engineering studies of the bridges. 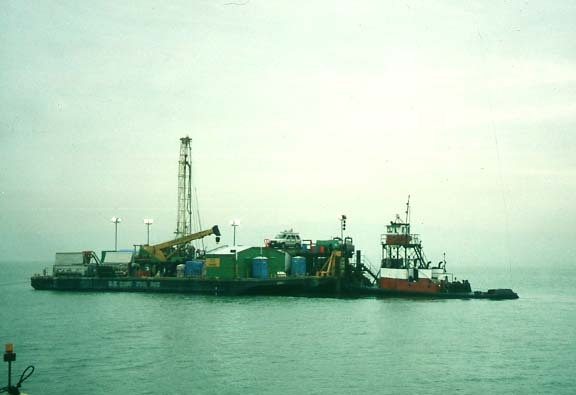 Here, in March 1998, they were determining the different kinds of materials beneath the Bay waters and their strengths in order to provide information for the Bay Bridge seismic retrofit.